NYC HHC is a network of 11 acute and community hospitals which offer quality surgery, rehab, and inpatient care. This SharePoint upgrade project had many unique challenges. There were eight hospitals involved and several of these had multiple MOSS 2007 farms. 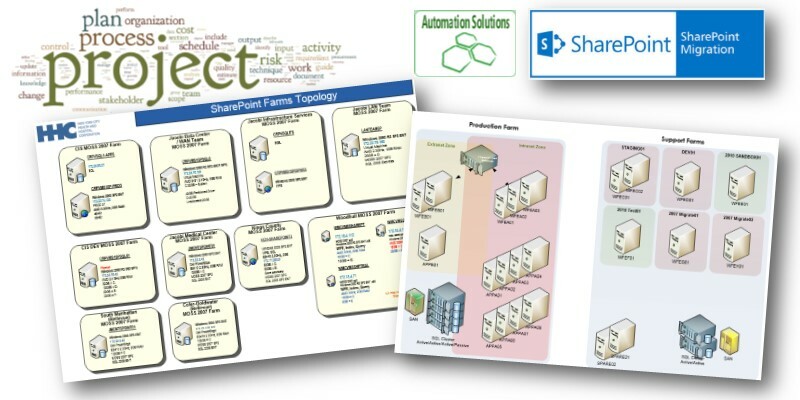 As is often the case with SharePoint, they had each grown organically, applying individual policies and database management techniques. It was decided for the long-term it would be wise to move to a centralized management farm. Our challenge was to evaluate all the separate 2007 farms, remediate them from extraneous third-party tools, and / or database issues, and prepare them all for migration to one large centralized 2010 farm. We built dozens of interim farms and a very large 2010 production farm. What we initially did was evaluate each of the 2007 farms for routine analysis of third-party web components, net code, patch levels, and database(s) health. We then created a pre-migration consolidation matrix. Because all 2007 farms were all in production it was imperative that no outages occur. What we did was build a mirror of all these 2007 farms in a centralized location and we worked out a system where the SharePoint admins (with our help as needed) copied their databases to this central location for testing. This 2007 testing farm then became our location for continuing remediation of the 2007 farms in preparation of migrating them to 2010. We built test farms, sandbox farms, and staging farms in a combination of 2007 version and 2010 version. It was a complex series of tests over several months, while we carefully coordinated with dozens of technical staff teams, and documented all things needed to be done to production 2007 farms prior to preparation for migration to 2010. This was our most complex centralized farm that we built to date. It consisted of two web front-end servers in an extranet zone (with app server) tied to a physical load balancer and SQL cluster. Additionally, there were four internal web front end servers and eight application servers. It is noteworthy that we built eight of these servers over the course of one day using scripted techniques. Despite complex challenges, advance security requirements, and coordination among dozens of departments, the result was a successful migration from the centralized 2007 farms to one large highly-available highly-redundant 2010 farm. Through the execution of this project, we also eliminated many redundant databases and balanced the SharePoint services carefully amongst this large farm. The system is running very well for communication, collaboration, and document management. SharePoint migrations can be very difficult so you want to be sure that you're using the best Microsoft SharePoint consulting services. Please read more about our zero business outage SharePoint migrations here and contact us today!